Last week was when we were hit by Snowmageddon here in Delaware. The feet of snow that fell on our beaches led to everything being shut down. At first school closed for Monday and Tuesday, then it closed for Wednesday, then on Wednesday we got the call that we wouldn't be going back until today. It was such a treat to be given a weeks vacation to hang out at home. I enjoyed waking up late, staying in my pj's all day, playing with the kids, baking/cooking, reading, knitting, and even doing a little (and I do mean little) cleaning and organizing around the house. But one of the best things about being off for a week was that I rediscovered my love of blogging. This week I learned that I really missed writing on my blog, visiting my favorite bloggers, finding new blogs to read, and just the whole blogosphere. I loved spending mornings writing new posts. I got to share our blizzard adventures, including the snowmen we made, and how the snow gave me a gift. I confessed my fear of failing, and wrote a few posts about my experience with the Special K challenge too. I was once again bitten with the blogging bug and now have a list on my phone and computer with post ideas. I even have an idea for a weekly meme that I want to start hosting soon! With my renewed interest in all things blogging, I also decided it's time for some changes around this here blog of mine. I've got a fresh design in the works and am super excited for you to see it. Jo-Lynne from DCRdesigns is working with me to create a fantabulous new look. At first I didn't want to change it till spring because the snowmen seems fitting for our weather lately, but as I keep seeing bits and pieces, I don't think I'm going to be able to wait that long. I just love makeovers!! In my effort to make my blog even better I'm also trying to see what my readers think about it. I put together a quick, 10 question, survey to see what you all like and dislike think I can make better. Would you help a blogger out and take the survey for me??? I'm even offering chocolate as an bribe incentive. So that's what I've learned this week. I've learned that I've missed my online community and I'm coming back!! 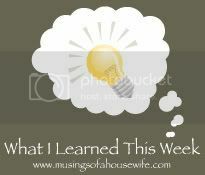 Don't forget to visit Musings of a Housewife to see what everybody else learned. Welcome back! I'm trying to get the bug back too. I do miss it. Thanks for the follow. Looking forward to meeting you at Bloggy Bootcamp. Exciting! I can't wait to see your new look. Welcome back to the blogsphere. It's nice to 'meet' you. X. Welcome back! I totally go through bloggy "seasons" where I'm blogging daily sometimes and then times where I'm only blogging once a week. I'm trying to be more consistent! I love that renewed feeling. Can't wait to see the new design! I'm a little behind on my bloggy reading. I LOVE LOVE LOVE your new design and new theme. Very nice!